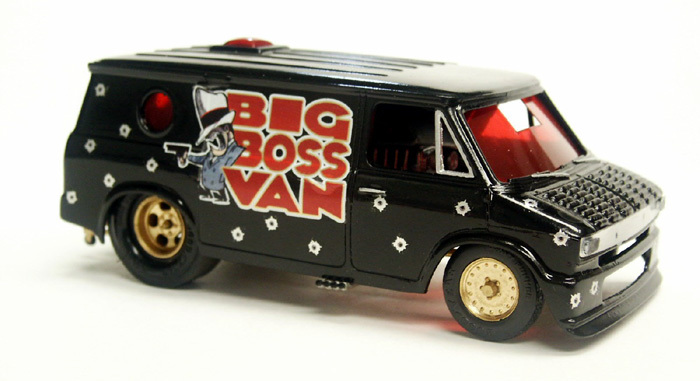 This is the Big Boss Van, made from a 1:32 scale snap tite t.d. designed streeto vandito chevy van. 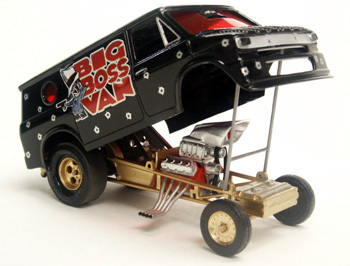 Willis pierce sent me the van body and chassis awhile back, and i was going to make a zinger out of it using 1:25 scale parts. I had a 1:32 scale funny car chassis laying on the shelf, and figured that they would go good together. 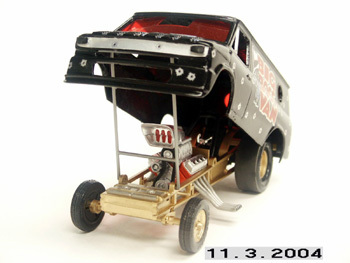 For starters, I had to shorten the funny car chassis to fit the van's wheel base. That was accomplished by moving the front axle back. 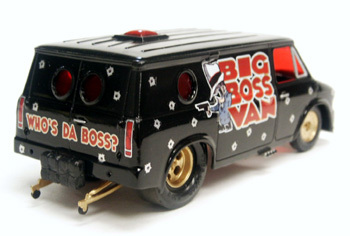 Once i got the wheel base right, i set the van body on it...it looked funny. The van body was too tall, so i decide to cut 1/2 inch section out of the center of the body. i filled the seams with spot putty, and i sanded forever on it to get it looking right. I had to make up a hinge system so the body would actually tilt. I used a peice of plastic rod, a small drinking straw, and the centers of two 1:25 scale brake rotors. the straw is glued to the chassis, the plastic rod floats free inside the straw, and is glued to the brake rotor centers on the ends. the brake rotor centers are glued to the inside of the body. I sprayed the chassis, rearend, front axle and all the wheels gold, and then clear coated them. I sprayed the engine block and trans. compitition orange, and the headers steel. the blower, intake manifold, valve covers, front engine cover, blower pullies, fuel tanks and scoop are sprayed aluminum. The blower belt set-up was missing, so I cut the pullies off of a 1:25 scale blower drive, and used a rubber o-ring for the belt. i used a 1:25 scale funny car steering wheel, and made the steering column from thin plastic rod. the windows were missing (except for the roof vent) so I made them up from sheet plastic and sprayed them all transparent red. I cut a hole in the windshield so that the roarin' rail scoop would get fresh outside air. The rear slicks are small 1:25 scale vinyl one peice, and I sanded them down. The decals were made by Dan Warford (slippery arts) and he did one heck of a job. The name is kind of funny, because between Dan and I, we came up with about 10 different names before we settled on this one. 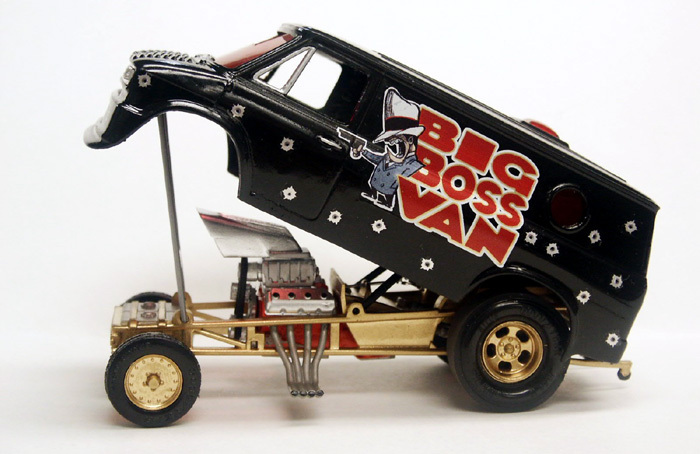 The name is a play on words because it's 1:32 scale, and i wanted to use the word Boss since Brandon Flannery had all those problems from the guys at Ford for using the word. The character is that guy Bugsey from the old Bugs Bunny cartoon...Dan Warford came up with using him on it. All of those little bullet holes are individual decals...they were fun to put on. The rear tail light decals are leftovers from my little Pinto funny car, and the headlights are some rear view mirror inserts from a Thunderbird. The rear parachutes came from my parts box, and I made the grill from pop can aluminum. The body paint is model masters gloss black, and then coated with clear laquer. 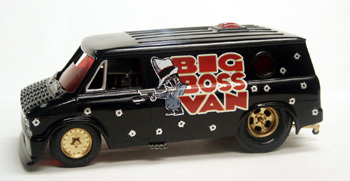 I have to thank Willis Pierce for the van body, Charlie Eshenbaugh for the chassis, and Dan Warford for the decals.